In all industry, huge amount of data are being accessed, stored, and backed up every day. A high performance and reliable storage system is required. Inc Solutions NAS features large storage capacity, high-speed file transfer across platforms, and secure RAID data protection. 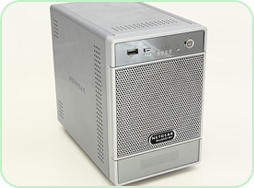 The NAS can be easily set up and managed in the IT environment. It is also an all-in-one server, which supports FTP server, web server, remote replication, file server, and more. Inc Solutions NAS is an ideal and affordable solution which enhances collaboration with partners and increases productivity. Inc Solutions NAS provides enterprise-grade functionalities and features an intuitive user interface which is easy to use and operate as well as complete online user manual and help so there is no required knowledge or learning curve to start using it. Inc Solutions NAS offers complete data protection through automatic schedulable backup to your choice of internal or external storage media. To prevent physical damage it also allows you to replicate your valuable data to other remote locations for emergency disaster recovery. At the end of the day you can be sure this large amount of data is safe and secure at all your remote sites. Data and file contents stored on Inc Solutions NAS can be easily set up for remote access from virtually anywhere whenever they are needed. Besides all the data traffic is encrypted using the industrial standards which make it impossible for unauthorized people to view the information travelling across the network. Inc Solutions NAS supports full standard network protocols you can facilitate partner collaborations by sharing files across platforms and geographical locations. Account creation for your partners can be done within a few seconds and individual access rights can also be assigned at the same time without complicated procedures. A network-attached storage is essential for data backup and efficient file sharing across the network and different department in most businesses nowadays. Inc Solutions NAS is an all-in-one file server ideal for data sharing and storage on both internal and external networks. The NAS can be deployed as a central storage server and a backup server with data protection by RAID configuration and secure data transfer with access right control. Inc Solutions NAS is available from 1 to 8 bay models, providing up to 16TB of storage capacity to meet the demand of storage-hungry business, workgroups, and personal users. Users working on different OSes, Windows/ Mac/ Linux/ UNIX can share file via the NAS. The NAS provides FTP service and supports SFTP (Secure File Transfer Protocol) for secure data transfer over the Internet. Inc Solutions NAS supports RAID 1/ 5/ 6 with hot spare configurations to protect the system from possible data loss caused by hard disk drive failure. Inc Solutions NAS provides excellent data transfer performance of up to 100MB/s via samba. This reduces the waiting time of file upload and download. The dual LAN models offer two Gigabit network interfaces which are capable of load balancing and fault tolerance to maintain high availability of the system and the data.